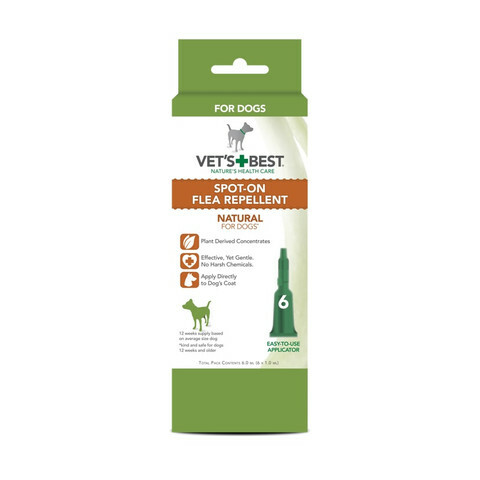 The Vets Best Natural Spot On Flea Repellent for Dogs 7 Puppies is designed to be effective, yet gentle with no harsh chemicals or synthetic insecticides. Containing plant based extracts which will render your dog or puppy unattractive to fleas. Optimum effectiveness is achieved 24 hours after the application, each application lasts for up to 4 weeks. This 4 week period of protection may be reduced if their fur and coat becomes excessively wet. In this instance, the product can be re-applied 7 days after the initial application. How much do I use on my pet? For Dogs & Puppies that weigh 1 - 10kg use 1 pipette. For Dogs & Puppies that weigh 10 - 25kg use 2 pipettes. For Dogs & Puppies that weigh more than 25kg use 3 pipettes. How do I apply this on my pet? Simply part the fur in-between your dog's shoulder blades (and the base of their tail if using 2 or more pipettes in the same treatment), in all cases to ensure that the product is applied as close to the skin as possible using the entire contents of the pipette. Margose (Neem) extract 0.1% w/w together with a blend of natural citronella oil 0.08% w/w, eucalyptus oil 0.5% w/w, and peppermint oil 0.5% w/w, plus denatonium benzoate in an aqueous, non-greasy solution.